Cut the eggplant and potatoes into small cubes about 1/2 inch. Wash and drain. Heat Oil in a pan and add the potatoes and fry for 3 mins till the potatoes are a slightly crisp. Then add the cumin seeds, fenugreek seeds, chopped onions,chopped green chillies, ginger and garlic. Fry for about a minute and then add the turmeric, salt, chilli powder, cumin powder, coriander powder and stir. Add the eggplant and mix with the potatoes and masala. Sprinkle a bit of water and cook it on low heat for 10 mins. 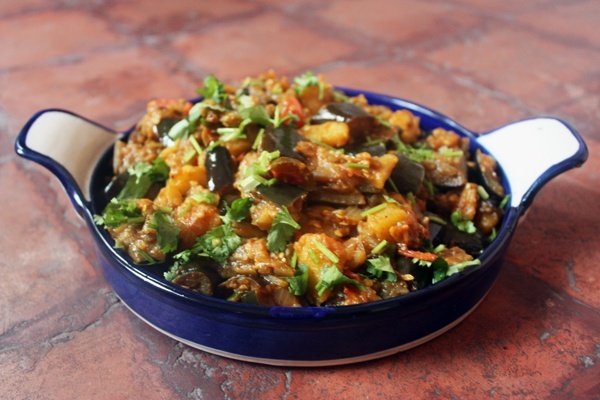 To make a tasty eggplant curry, the eggplant should always be cooked with minimum water over low heat. When the vegetables are a bit soft, add chopped tomatoes and the chicken cube ( this is optional and is added to give a nice flavor to the eggplant) . Sprinkle a bit of water and cover and cook for additional 5-10 mins till the vegetables become tender and the oil starts separating . Serve in a dish and garnish with coriander. This entry was posted in Vegetables and tagged Brinjal, Eggplant, Indian vegetable by Kamakshi. Bookmark the permalink.